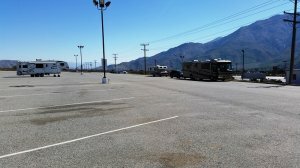 and just before the road ends is a right turn, take the right and the last left turn before going into the parking structure will take to the RV area. We had the buffet and it was good, and my wife played the slots came away with more than she put in but not much. Over all a good experience but can get windy quickly.